The Road Trains going through. Thankfully, the weather has calmed down from its hissy-fit last week. A warm week this week but temperatures will be no more than mid 30s. 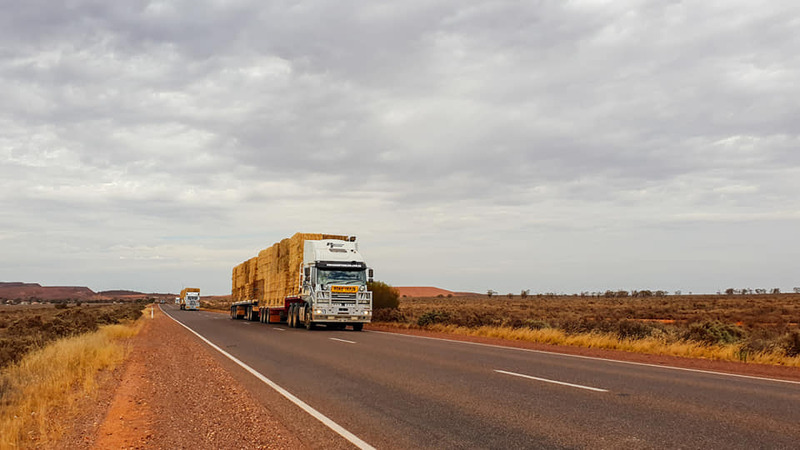 The Hay Convoy of 50 B Double Trucks went through on Friday and I did get a lot of photographs and a video that had been sent to me. It really was something to behold and I am sorry that I missed it but watching the video was incredible. Perhaps next time they go through I will be able to see for myself. They always go through that way but this is the first time we have ever had notification of the time they were going through. Actually, they have to go through where they did – there is no other way. – Well, there is, but it would add about 1100 klms on to the journey and not really achieve anything. Saturday was Australia Day, which started out fine – a bit cool, but fine. By 6:30, the temperature had fallen and the rain came down. It wasn’t really all that heavy but it was constant and the latter part of the Australia Day Celebrations were canceled – although the fireworks did go ahead. John Jnr and I spent Saturday at my niece’s place moving furniture. She was only here for seven months and she is now heading back to Adelaide. Some things she didn’t want to take back with her, so they went onto my trailer and into the garage and the church may dispose of them. Back to the doctor with Annabell this morning. This was a planned visit, but not a good one. Generally her blood sugar level has been controlled by diet, but that is no longer working. Doctor wants to put her on diabetes medication but can’t. He has to contact a specialist in Adelaide, explain the situation to them and they will decide what medication is suitable for her, given her health concerns and her current medications. So we just have to wait. I had a telephone call this afternoon from one of the major Hardware firms and they wanted to give us (RFDS) the space to run a fundraising event at the store. I said I would see what I could do and try and get a team together. I will call them first thing in the morning and accept since I have a team available for them. Ten days and I head off to Adelaide for conference. We plan these days away and both of the boys either telephone her or just come over and see she is ok, The Weather people lived down to their reputation yet again. Fine weather, they said – temperature in the mid to high 30s, they said. What they didn’t say was 43c today. It be a wee bit warm. Ah, look on the bright side – We survived 48.9, we can survive 43c. The danger period will come in about two hours when people start getting home from work and cranking on air-conditioners, which could overload the system. Might even blow a fuse again. As it happened a cool change swept in and brought temperatures down quite a bit. Temps came down, wind came up and we had dust problems which I could see in the distance when I was walking with Benji. Come the weekend and we are looking at high 30s again, but that’s fine. I think one of the things that has made people grumpy is that many Australians have been unable to do what they would normally do in summer. Generally, in the backyard with friends and family – barbecue and a few beers, a glass of wine – backyard cricket with the children, and so on – in the park or down the beach. Not so much since it’s been blowing every day for weeks, then the heatwaves came along and all of this has disrupted the Australian lifestyle. I don’t do any of this but I like to go walking with the dog or dogs and I can take them out despite the wind, but the heat causes problems for dog paws, so it’s after 9pm when the sun has gone down and it’s starting to get dark. From time to time Benji will dig his front paws into the ground, lock them and refuse to move. I have no idea why he does this but after a minute or so he will start walking again as normal. I think he does this because he wants to see if my arm can actually come away from my shoulder since he does this without any warning. The heat is not only causing problems for us uprights and our companions, it is also causing problems for our wildlife. This is mainly exacerbated by the drought and just the general lack of moisture in the bush. It is really pleasing to see that more people are filling buckets of water the leaving them in their gardens. .
“No more than mid 30s”. Eep! Honestly, I complain about our climate but I don’t think I could stand that. You could, actually. It is a different kind of heat from the Northern Hemisphere. I know it is difficult to understand, but it is so. . When John Jnr. was on holiday in Europe a few years ago – he struggled with the heat in Spain and France and yet it was colder than what he was used to here. He loved shopping with the family in Glasgow. we send lots of potp to you and we hope the specialist has a solution …. Yes, thank you. I hope so to and it should help to settle her down a bit. Mother Nature is going slightly GaGa at the moment. After the longest and most devastating drought on record,North Queensland is experiencing the most devastation rain, flood on record with whole towns being evacuated, The worst floods in 100 years they say. You just can’t win at the moment. And we are back into the 40sc from tomorrow and our drought continues. I heard a story this morning in fact about the flooding-so unbelievable. I will keep you in my thoughts and prayers.